Attend six different affiliate festivals and one state convention. The California Square Dance Council, Inc. ("Council") and the dancers of its Affiliates (associations, federations) are members of the United Square Dancers of America, Inc. ("USDA"). USDA provides two insurance policies, one is Liability Insurance and the other is Accident Medical Insurance, for the Affiliates, clubs, and dancers. Each policy is group coverage and is provided to all dancers and clubs who belong to an Affiliate of USDA. Any questions concerning insurance should be directed to the Council Insurance Co-Director Carolyn Ulrich <castateinsdir@gmail.com>. If she cannot answer the questions, she will contact the USDA Insurance Coordinator. But check the Frequently Asked Questions section below - the answer to your question may already be there! The insurance company establishes the cost per dancer for insurance. Council and each Affiliate may increase the fee to cover administrative costs. Monies collected for insurance MUST be designated for that use only. Affiliates and clubs need to be covered by insurance to provide protection for their dancers. Almost all of the facility contracts entered into require some type of liability insurance coverage. This information must be submitted to your Affiliate's Insurance Chairman each year. Downloadable forms are listed in the "Forms" section below. 1. You no longer have to list specific dates and rooms on your Request for Certificate. You are automatically covered for the entire year for the entire facility. 2. There is now a space on some forms for your club's 2019 USDA number. This number can be found in the file name of the electronic copy of your 2019 insurance certificate (e.g. USDA410 Cowtown Singles) or in the top left line of your hard copy insurance certificate from Markel (e.g. Certificate Number: USDA 410). 3. All Insurance forms, handbooks, brochures, and FAQs are now posted on the Council website (squaredance.org). Insurance protects us against loss, injuries, accidents and liability. As dancers we are exposed to a multitude of situations over and above normal everyday activities that could result in any of the above situations. What does our insurance do for us? Our accidental insurance plan is a supplemental plan covering dancers while participating in any regularly scheduled and sponsored dancing activity worldwide. Does Markel offer supplemental insurance for Board meetings, Club meetings, or social activities where there is no dancing? When does club/dancer insurance coverage begin? Insurance coverage for a club and its members begins when their enrollment form, a signed roster form, and payment is received by USDA National Insurance Coordinator. What are the effective dates of our insurance policy? Our insurance policy runs from January 1st through December 31st each year. When you obtain a certificate of insurance for a facility, the certificate is good for the entire year for that particular facility for any event held in that facility on any date. What does our dance insurance cover? Our coverage is two parts: accident medical and liability. Our accident policy is a secondary insurance. It covers unpaid medical bills on injuries incurred at a dance activity not covered by the insured's other insurance policies. The liability insurance protects the club and its members and association officials from financial loss due to unforeseen incidents which may develop into litigation against members and dance organizations. Can we get increased coverage/liability limits for one of our facilities? No. Our coverage limits are already maximized for the enrollment fee we pay. Can a dancer get USDA insurance and not be a member of an insured club? No, to obtain insurance a dancer must belong to an insured club and 100% of the membership has to participate in the program. Can a club belong to a State Council Association and not purchase the USDA insurance? Are non-dancers or dancers from other areas covered under our insurance? Our accident policy covers only members of clubs who have paid an enrollment fee per dancer to USDA. Since USDA is a national insurance program, it is likely your visitors are covered through their own clubs. There is coverage under our liability policy for non-dancers if injured. What if an independent dancer gets hurt at our dance? The independent dancer would be responsible for his/her own coverage. If the dancer feels the club is negligent, thus causing the accident, then the independent dancer would have to sue the club for compensation. If this happens, Markel will handle all legal matters for the club. There is no extra cost for this service. What if a person who only belongs to a caller or cuer group gets hurt at our dance? Unless the caller or cuer group has submitted a club roster and paid the per dancer enrollment fee, there is no USDA insurance coverage for this dancer or the club. The caller and/or cuer may have coverage through their professional organizations but it does not cover the dancers. If a dancer has 100% primary insurance coverage, can they opt out of the USDA insurance program? No. USDA requires all club members be insured through USDA in order for the club to obtain their liability insurance. Are students covered by insurance? Beginning students are covered at no charge for nine months while taking lessons. After nine months, students are expected to be ready to join a club and pay the enrollment fee to be covered. A class roster must be submitted to have the students covered. How many times can a student dancer be insured at no cost? Once. If they continue on to a subsequent class, or repeat a class, they must pay the insurance fee. Is there a limit to the length of our class? Yes. Classes may last a maximum of 9 months. Is our A1/A2 class covered at the student rate? No. Only Beginning Square Dance classes are covered. Advanced class students need to be insured as club members. Is a student dancer covered for the calendar year? No. They are only covered for the duration of the class. After that, they need to be insured as a club member. Coverage begins when a dancer leaves their mode of transportation for an activity and ends when the dancer returns to their mode of transportation at the end of the activity (i.e., getting in and out of the car is not covered, but walking through the parking lot is covered). What is the process for reporting an accident? The club completes the Club Accident Report then sends it to their Association Insurance Chairmen who sends to State Insurance Director. A claim form is sent back to the State Director to get to the person who had the accident. The injured dancer will complete and send back to State Director along with bills he/she might have. The State Director will sign claim form and send to USDA National Insurance Coordinator who will send to insurance company for processing. The claimant will then be contacted by the Insurance company and given a claim number and instructions for submitting additional bills. What happens if someone drinks alcohol at a dance? A club officer should be notified and the dancer will be asked to leave the dance. Do we need special insurance for our New Year's Eve dance? No, but you do need the insurance certificates for the current year and the upcoming year (e.g., 2018 and 2019). Current year certificates expire one minute after midnight on New Year's Eve. If our special event venue requires an insurance certificate, do we also need to submit an Event Notification? No, but do be sure to submit the Certificate Request 30 60 days before the event. Are we covered on square dance cruises and tours? Only for the dance activities. On group travel, can the group make stops along the way, i.e. picking up other dancers, stopping for a break, taking a tour? The travel information states that travel must be a continuous between point of origin and point of destination. You can stop and pick up dancers, or stop for a break, but no sight-seeing or other ancillary stops where incidents could occur not directly related to dancing. Are we covered if our club does a demo at/before a baseball game or other social event? No. Coverage is only provided for scheduled and sponsored dances in a public venue. If your club is going on a social outing and there's even a remote chance you'll be dancing, submit a Special Event form. Better to have the coverage and not need it, than need it and not have it. Are we covered if we dance out of town? Yes, as long as it is a scheduled, sponsored square/round dance in a public venue. Are we covered if we dance at someone's home? Are we covered if we dance in a parade? Riders on a float are covered. The float is not covered, nor the vehicle pulling the float. Markel would prefer that riders not dance on the float but on the ground if they dance. Are we covered for club/board meetings or social events/outings? No. Only for dancing activities. Are daily sign in sheets required at state conventions? No, not required by USDA. Are sign in sheets required at demos, exhibitions, parades? A decision about sign in sheets is made by Association. USDA does not require a sign in sheet. How soon can I get a certificate for next year? Once the annual enrollment fee is announced and your Association has paid their State Council dues. Can a certificate for a special dance at the beginning of the year be requested before the roster is sent in to be registered? No certificates are issued for any dance until the roster, enrollment form, and enrollment fees have been submitted for the new year. How many members need to be on the roster in order to enroll for insurance coverage? Eight (8) dancers are needed on the roster for a club to enroll for insurance coverage. Some of those 8 may be "insured through another club," but the $48 California minimum must still be paid. If some of our members are "Insured Through Another Club," do we have to submit a copy of the other clubs' rosters with our paperwork? It is expedient and helpful to submit the other club rosters with yours, but it is not necessary. The state insurance director will hold your paperwork until the "Insured Through Another Club" enrollments can be verified. Which insurance forms must be submitted each Fall? What are the other forms we might need throughout the year? Do I need to put my club's USDA number on every transaction? Yes, this helps with identification of a club. Where can I find my club's USDA number? In the file name of the electronic copy of your insurance certificate (e.g. 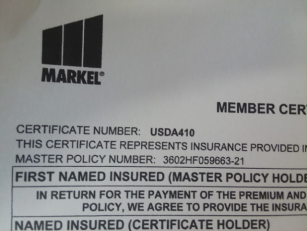 USDA410 Cowtown Singles) The top left line of your hard copy insurance certificate from Markel. Does our club's USDA number stay the same from year to year? No. A new number is assigned for each year. Think of it like a high school locker number. Once you have been assigned a [USDA] number for the current year, it needs to be on every transaction for that year. It can be handwritten or typed onto any form. You will get a new USDA number when you enroll again next year. What if my facility requires special wording? Markel is able to satisfy most requirements of a facility. Try to obtain all requirements before submitting your request for a certificate. Special requests may take longer than 60 days to process. What is a blanket endorsement form? Why would I need one? It is a document required by some facilities in addition to the certificate of insurance. You would only need this if it is requested by the facility. What is a CG 20 26? Any time your facility requires any type of special wording, additional insured, or endorsement, a CG20 26 will have to be generated. It is a separate 5 page document that will follow several weeks after your regular certificate. What is the turn-around time for receiving our new certificate? Approximately 60 days from the time your request reaches the national insurance coordinator. Certificates with special wording may take longer. Is there a pro-rated insurance rate if a student or new member joins mid-year? Is there a refund if a club folds mid-year? If a dancer resigns or dies within a club, can another dancer's name be put on the roster in his/her place? No. If a dancer resigns from an insured club, the dancer has 30 days to join another insured club before his/her insurance coverage lapses. In addition to the written material available here, people involved in managing the insurance program for their groups may want to take advantage of in-person information sessions that are held from time to time. A meeting for Affiliate insurance chairs/coordinators is traditionally held in conjunction with the September meeting of the California Square Dance Council. Many Affiliates try to arrange for their insurance person to attend, especially in cases where a new person is taking over the job and will be doing the work needed for the upcoming year for the first time. For information about attending this meeting, check with your Affiliate representative or area Vice President. 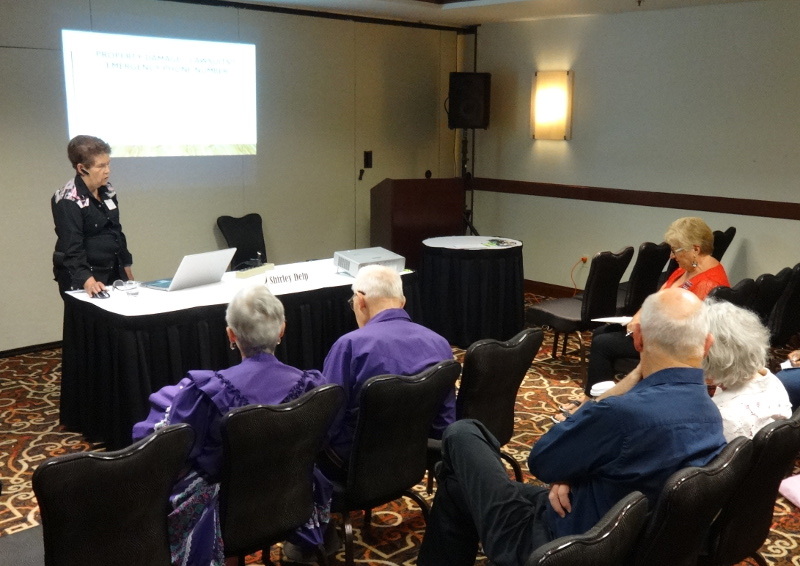 A session about insurance is typically included as part of the Education Program at the annual state convention. Larger events like the National Square Dance Convention and USA West also often have a session on this topic.